- A welterweight bout between Neil Magny and Gunnar Nelson was expected to take place at this event. However on April 28, it was reported that Nelson pulled out of the fight due to a knee injury. On May 15, promotional newcomer Craig White was announced as Magny's new opponent. - Salim Touahri was scheduled to face Brad Scott at the event. However, Touahri pulled out of the fight in mid-May citing a knee injury. He was replaced by promotional newcomer Carlo Pedersoli Jr. on May 17. - A bantamweight bout between Davey Grant and Manny Bermudez was expected to take place at this event. However, it was reported on May 24, 2018 that the bout has been scrapped as Grant was diagnosed staph infection. i don't get how the odds are so close for the main event. Thompson is a clear favorite in my book. Like -175 at least. Till is good, but it's the hype train + fighting in his home city of Liverpool + knocks guys out (TKOs) + younger and fresher face. I like Wonderboy to win via decision or late TKO. I have a bet on Over 3.5 rounds, so I hope Wonderboy does what he did to Rory and Masvidal. Till slows down after 2 rounds, so he better come with a different strategy if he wants to win. He already said he'd KO Wonderboy in the 2nd round or within 2 rounds, but I doubt that will happen. Are the times of the event right? it will happen at the same time as the Champions League final? The times I listed are correct. This fight card is in England, which means it starts earlier than usual. Edit: I just changed the date in the original post from Saturday to Sunday. This UFC card is on Sunday in both USA and England. They are both counterstrikers with sick reach, but Thompson has the better kicks and distance control I think he takes this one. Watch Woodley vs McDonald, its a blueprint how to beat Woodley and its an easy one that Wondeboy should have followed and cruised to an easy win. Woodley backs up to the cage eating damage looking to explode either with a takedown or running with a hard right hook, all that Rory did was keep him there pot shotting him with jabs and straight rights and doing a front kick to the ribs, Woodley collapsed. "A bantamweight bout between Davey Grant and Manny Bermudez was expected to take place at this event. However, it was reported on May 24, 2018 that the bout has been scrapped as Grant was diagnosed staph infection." Anyone has a better link than op ? Great win for Gillian Robertson. She showed some nice grappling and actually looked like a true brown belt, unlike other females who have brown/black belts in the UFC. 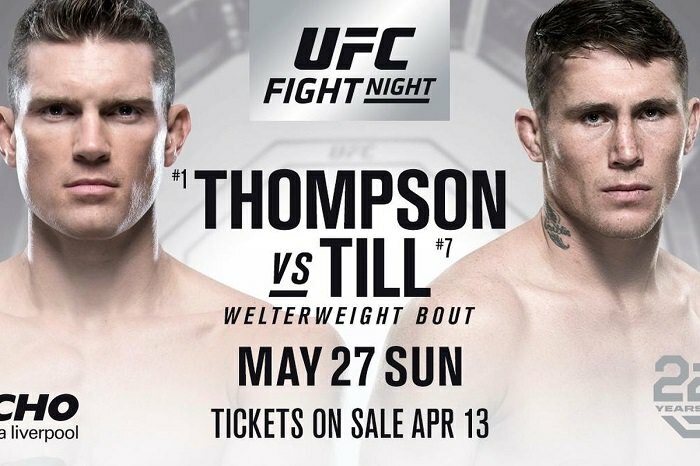 Darren Till 3-2 or 4-1, imo. R3 decides how much Till won by. Wonderboy suffers the "Anderson Silva syndrome", he becomes utter garbage against people who aren't being aggresive, you need a strike to force your opponent to come in, not everybody is going to be an idiot and bullrush you, i dont know why wonderboy just doesnt sidekick non-stop on the ribs to force a reaction.